Will Democrats Nominate a Woman in 2020? RUSH: What are the odds that the 2020 Democratic presidential nominee is gonna be a woman? Pretty solid, right? 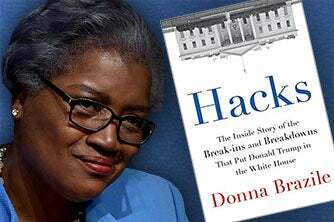 You know, it makes my theory that what Donna Brazile’s doing is setting up a run by Michelle Obama. I mean, it’s looking more and more likely. Hillary Clinton can kiss it big, fat good-bye, if she has got designs on the 2020 nomination, there ain’t no way, Jose. And they gotta be a woman, right? In fact, I just saw a story, the GOP, the Republican National Committee, is raising money out the wazoo, compared to the Democrats. The Republicans in the latest reporting cycle raised $113 million. The Democrats remain in debt. What do you think, maybe the Democrat National Committee could make a specific special appeal to women? You think that would fly? Hee-hee-hee. No, I don’t think so. But it is making my theorem that Donna Brazile’s trying to push Hillary out of the way to clear the decks for Michelle Obama. It’s gotta be a woman now. It has to be a woman. And there’s gonna be other women besides Michelle Obama that want this. You know, you’re gonna have — who could it be? I mean, Fauxcahontas may throw her wigwam in the mix here — ahem — headdress, whatever. If the Democrats have a primary that features at least one white woman and one black woman — (interruption) No, it isn’t gonna be Kamala Harris. See, you have to discount the early front-runners, proclaimed front-runners by the media. Discount them. They’re never gonna be there at the end of the day. That’s all conventional wisdom that never holds up. Kamala Harris isn’t gonna be there. That was a trial balloon and it isn’t working. I mean, she may have a pocket of support out there in the ultraleft-wing pockets of the Left Coast, but, nah. But put her in there. I don’t care. That’s not my point. What are the Democrats gonna do? You know Biden’s gonna go for it no matter what. Biden’s gonna be in there. There have to be some other guys in the Democrat Party that are gonna want it. And there will be women, and one of them is gonna be Michelle, and what if the other one is a white woman? Can you imagine the politically correct problem the Democrats are going to have? Everybody thinks they’re just gonna skate through because of supposedly sky-high Trump disapproval. I think this Democrat Party continues to be mired in more trouble than they’re even aware of, and certainly much more than they will admit. This sexual harassment stuff, all of these people, all of these names, they are all liberal Democrats. And they’re all very vocal about it, from the Hollywood guys to the money, to the fundraising, to the issues that they attach themselves to, such as climate change or gun control. We don’t need the media to point out the hypocrisy. We can see it. And we’re not through with names. We’re not through with names of people being accused of sexual harassment or abuse or what have you. As I say, outside of Conyers, we still don’t have a name for anybody in Congress, and yet there have been secret payments of, what, $15 million, with nondisclosure agreements so those women can’t legally speak about it. The Democrats are relying on the same old thing. They’re relying on the fact that by the time we get to 2018 or 2020, that they’re gonna be able to convince enough people that Trump is a reprobate and a scumbag and whatever else. And they have failed to do that up to this point. And I don’t know why wouldn’t think that in this current atmosphere they’re gonna be facilitated in that effort. Salena Zito is still out talking to these people, and they’re not leaving Trump. They’re not abandoning. The Democrats are counting exclusively on that, and it isn’t happening. The Republicans are gonna be in hot water, too, themselves depending on what happens with the congressional agenda.